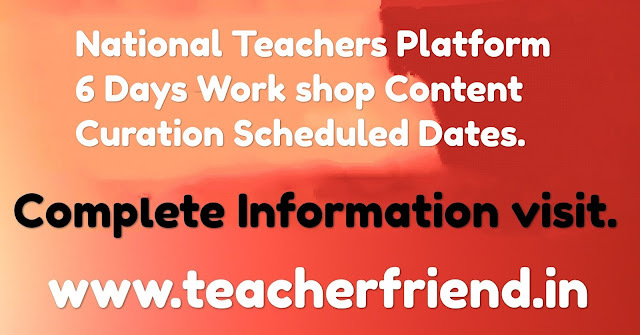 AP National Teachers Platform for Six daysWork Shop on Content Curation from two spells Scheduled and Venues list as per Rc.no 315/AP SCERT National Teachers Platform for Six daysWork Shop Two Spells Scheduled and Venues as per RC.No:315. AP National Teachers Platform for Six daysWork Shop on Content Curation from 08-05-2018-to 13-05-2018 in First spell and 15-05-2018 to 20-05-2018 Second Spell Deputation from Identified Resource Persons and teacher Orders Issued as per Rc.no 315. This Programme will be Conducted in two spells in scheduled given below.